Welcome to december. I got back to the desk at the weekend. 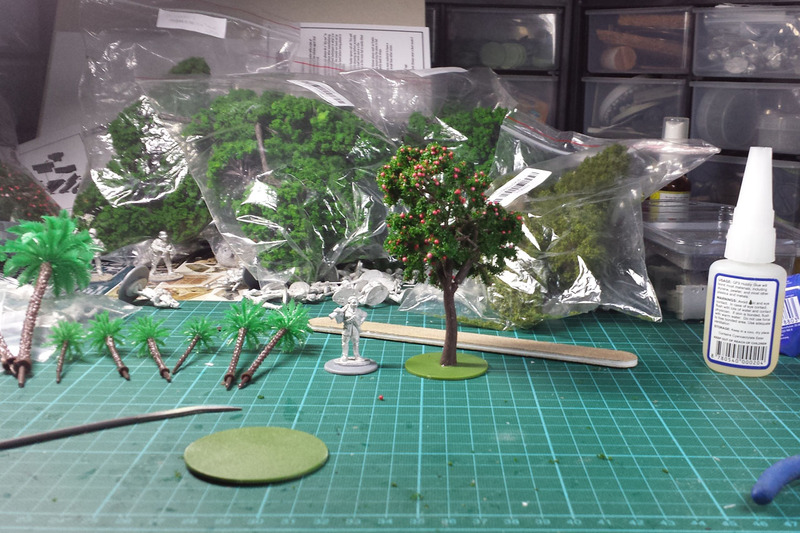 My model trees from china arrived (9 bags with ~ 10 trees each, 28 euro incl. shipping) and the matching Renedra Bases from Fantasyladen. 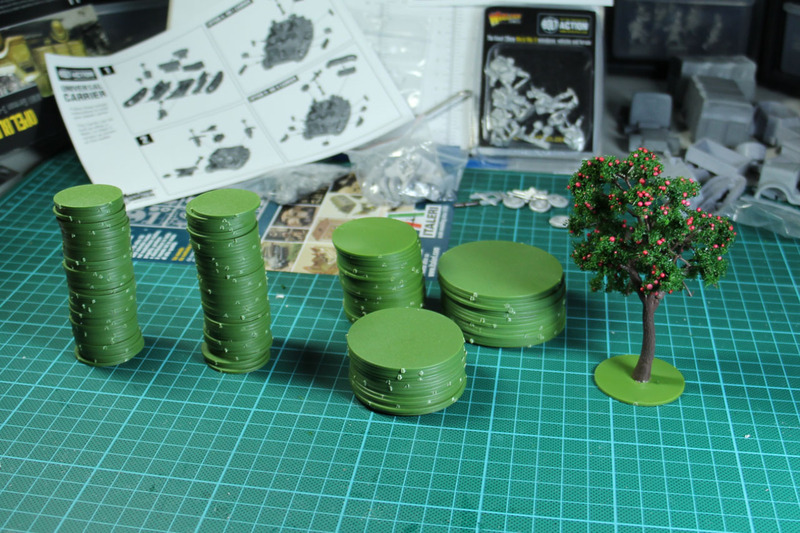 As i didn't want the trees to be exposed from the tabletop, i used the flat bases. The trees have to be coated with hairspray, so they don't loose that much foliage during handling. The second, a bit noisy, picture was a fast snap from my mobile phone, to show the scale with 28mm miniatures. I survived the tank week and ordered a few more kits from Rubicon and Warlord Games. 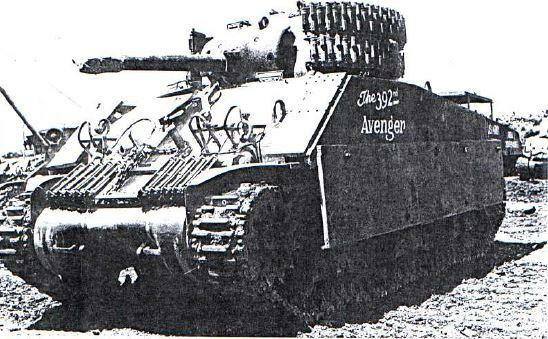 Among them two additional Rubicon M4A3 Shermans. 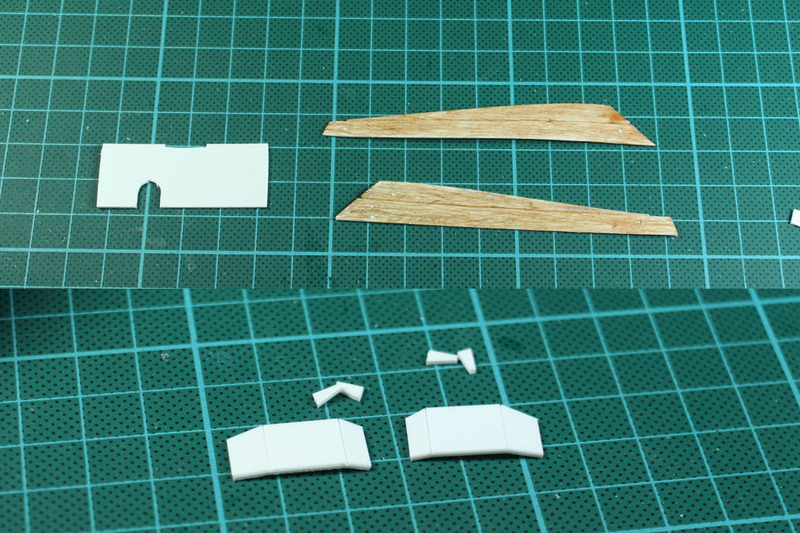 I grabbed a bit of plastic card and started scratch building. 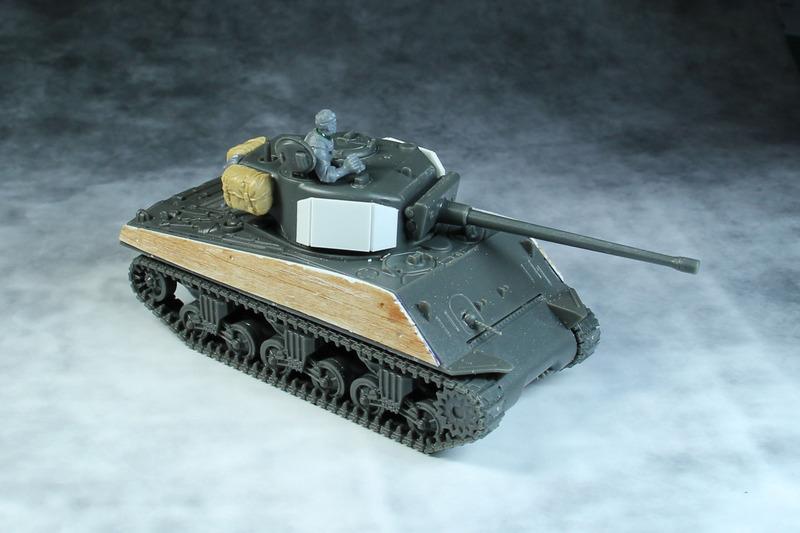 One of the M4A3 got the 75mm turret and the 105mm howitz gun. 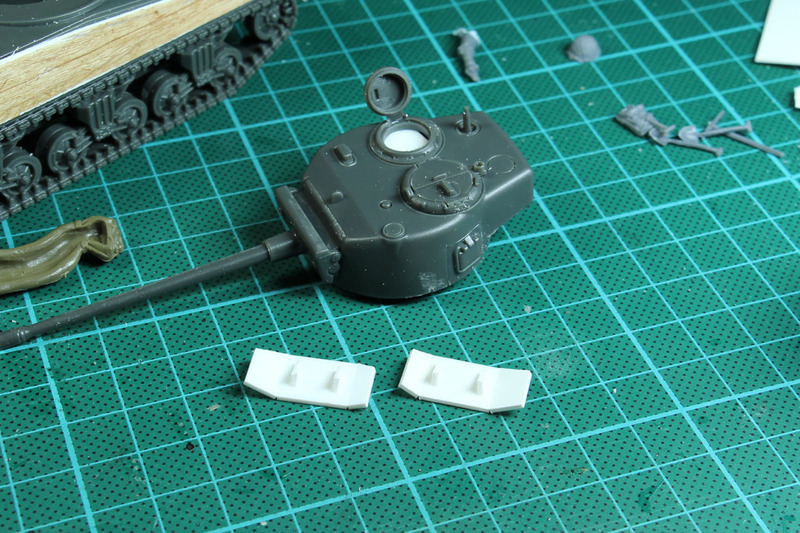 In addition i gave the kit a few welded on metal plates at the front and sides, as improvised skirts. On top of that, i welded the pistol port on the turret. I did this with Vallejo Putty and scratching little gaps into the half-dry putty. 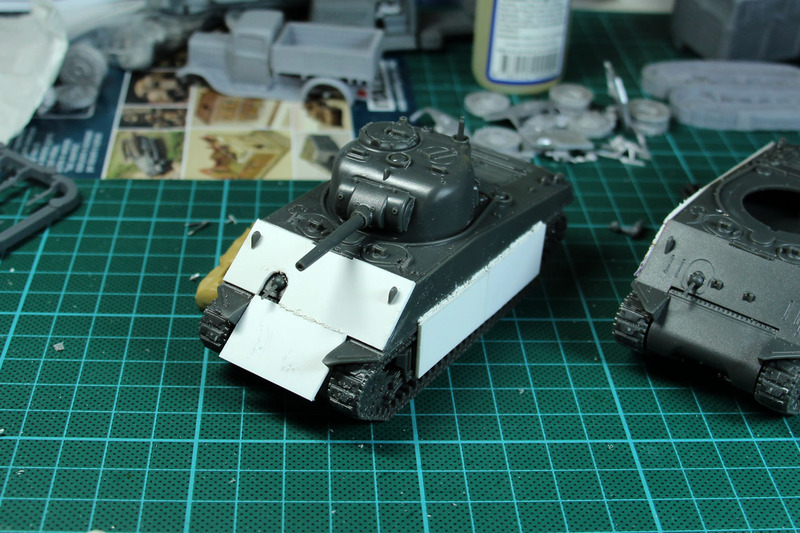 The sideskirts /-armor were field conversions, as the pictures below show. They were found in western europe as well as the pacific. My source for the pictures is among others Sherman Minutia. 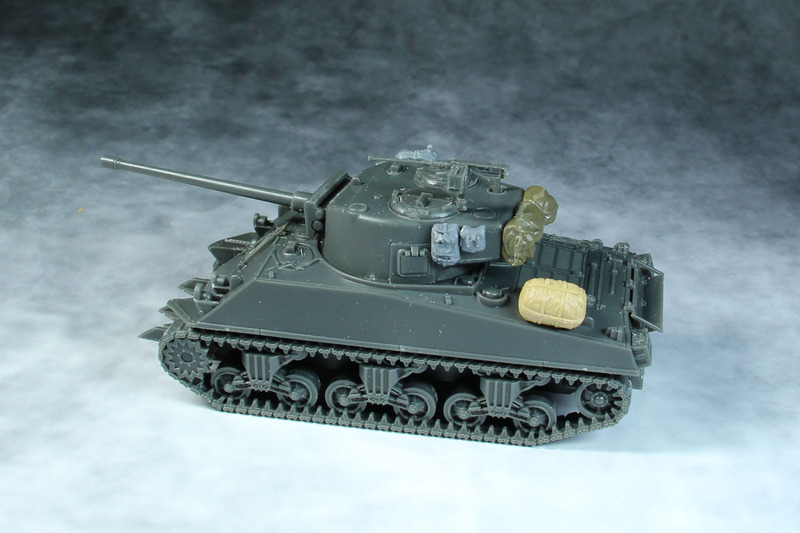 The second M4A3 was assembled with the 76mm turret and will be the command vehicle of the platoon of 3. 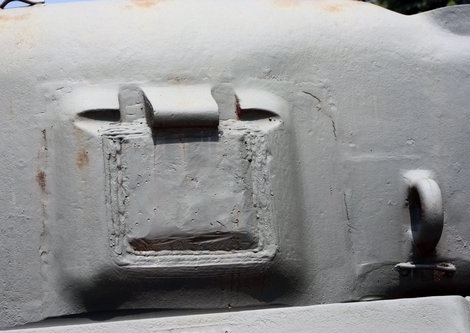 The tank got wooden armor on the sides. These are made from plastic card, which was scratched with a cutter. Adding more and more scratches, giving it more texture, i moved the blade with the broad side along the surface, to widen the gaps. 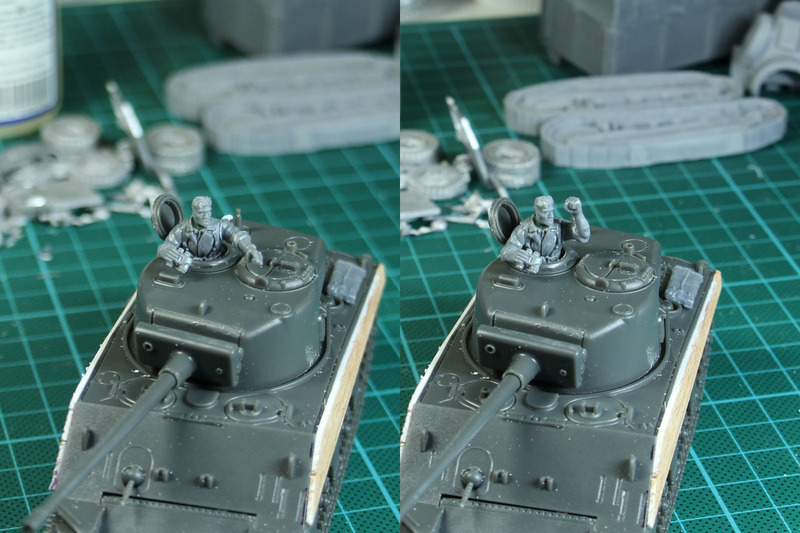 In addition the turret got some improvised armor and a tank commander. He was built using the body of an US Infantry model, the arms from the US Marines and the head without helmet from the Blitzkrieg infantry. At the moment i am not sure, which arm to show. The closed fist or the pointing hand. Why a tank commander without helmet or leather hat? 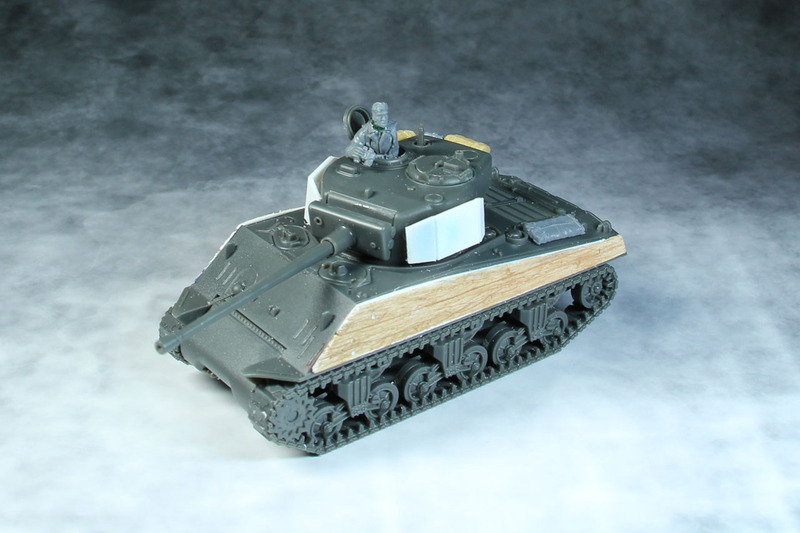 The shermans will be the armored support of the mobile infantry, so that he supports the troops on foot by his higher position. Beside that, he looks a bit like wardaddy with his undercut. 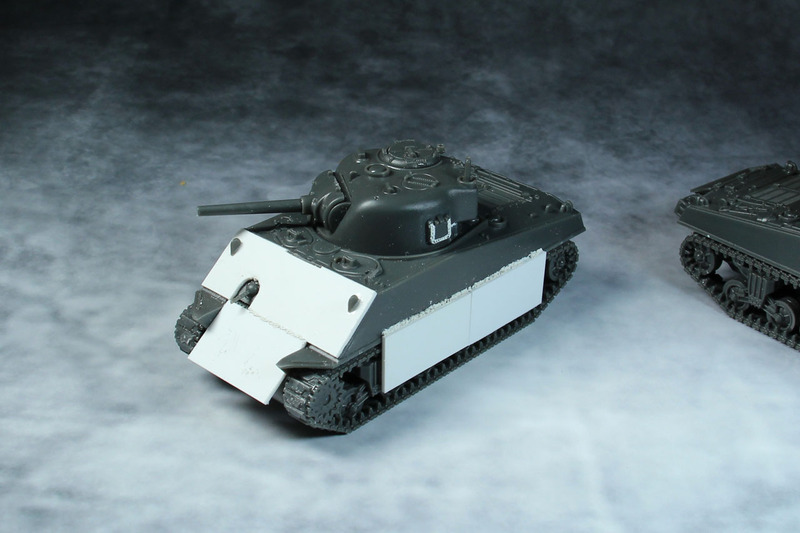 The turret was built with the Thunderbolt VII in mind. 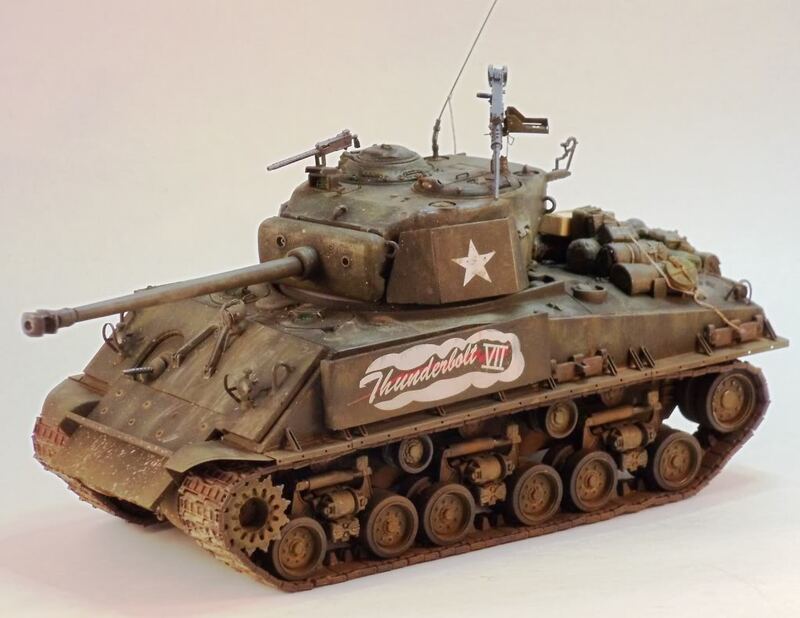 That tank was a M4A3E2 Jumbo (with the HSVV tracks), but as a field conversion this works quite well. 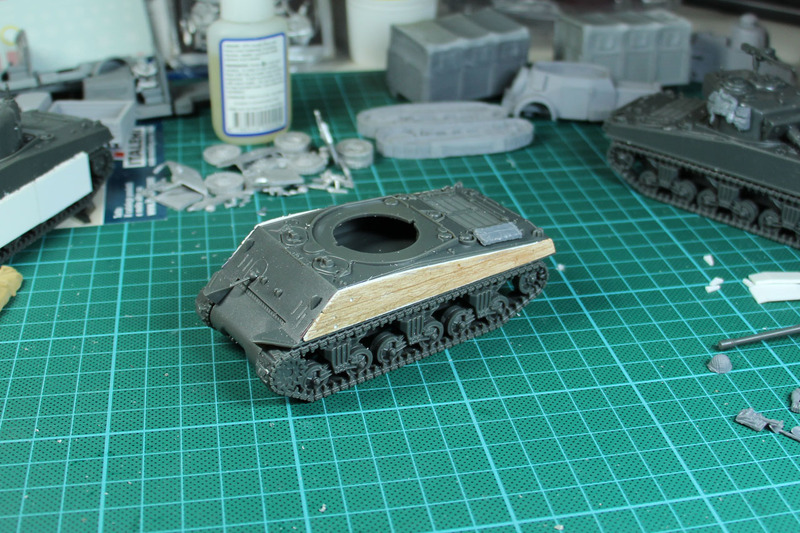 The edges will be filled with putty and get the same welded look as the other metals from the 105mm howitzer. I am thinking about filling the gap between the turret and armor with some small equipment, like bags and field flasks. The third tank in the platoon is the M4A3 from the review, that primary got additional baggage. I used Tamiya parts (US Modern and Allied Vehicle Accessoires) and bags from the different infantry sprues from Warlord Games. Yes, the tamiya stuff is 1:35, not all of the bags can be used. But if you cover them with netting or tilt, it works just fine. As mentioned above, due to the combination of infantry and armored troops, i just makes sense to put your heavy luggage onto the vehicles, to spare your sore back and feet. Of course there are still some details to glue an, like the lamps etc. 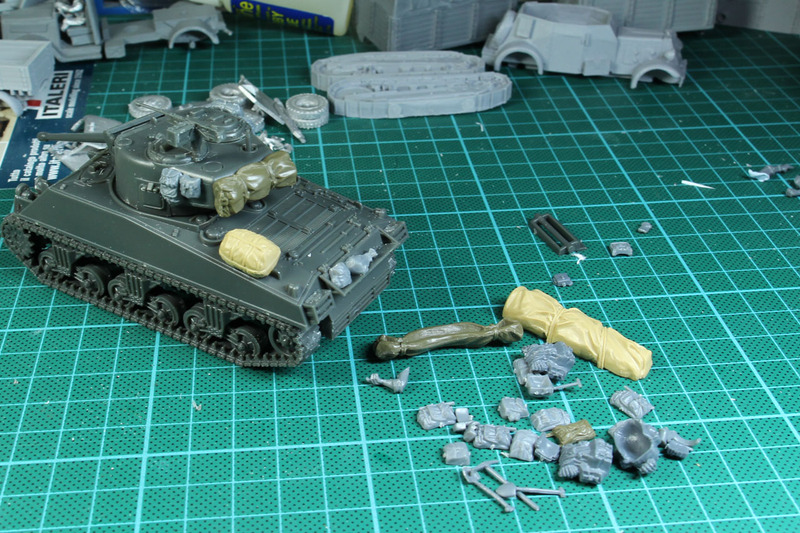 But after that, i have to clean up the desk, so i can use the Airbrush to give them a nice coat of US Olive drab.